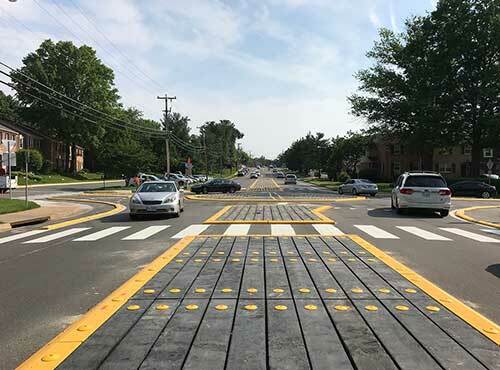 The Federal Highway Administration (FHWA) recently began a pilot program to examine anew modular approach to construct mini roundabouts that use prefabricated materials, like raised islands made from engineered plastic developed from recycled plastic bottles, which will allow for ease of installation at a lower cost. 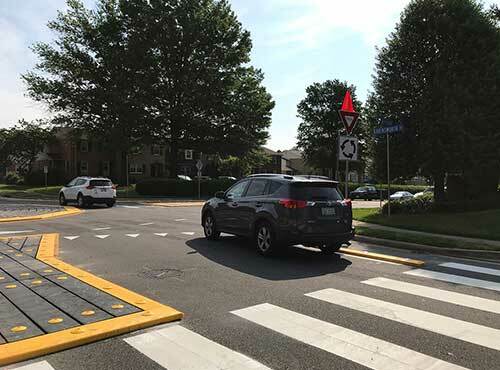 MTJ Roundabout Engineering, in conjunction with ZKxKZ, LLC of Lexington, MA, provided design support for the latest mini roundabout in this initiative located in Annandale, VA. The previous intersection was dangerous for traffic entering from side streets, for making left turns, and particularly hazardous for pedestrians. The design and review of colors and specifications provided by MTJ were instrumental in creating a safer environment for all modes while preserving the capacity of the intersection. 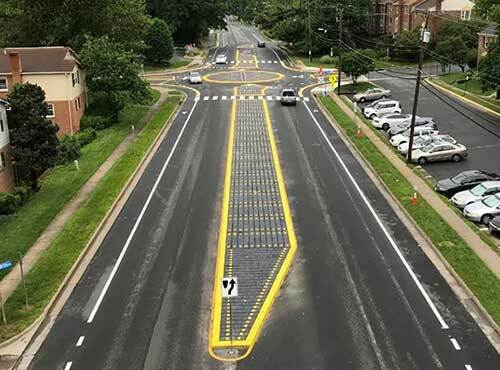 The Virginia Department of Transportation (VDOT) reported that this project required no new pavement, utility relocations, drainage, or other work which kept costs significantly lower than other alternatives. Best Paper Award at 2018 TRB Annual Meeting! Mark Johnson receiving award at TRB. 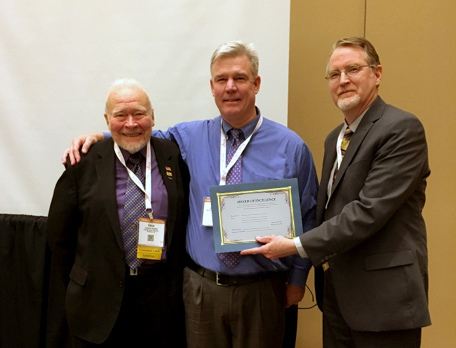 Mark T. Johnson and Ting-Li Lin’s (Ph.D., Statistics) paper, “The Impact of Geometric Factors on the Capacity of Single-Lane Roundabouts,” received the TRB Roundabout Committee’s Best Paper Award, presented at the 2018 TRB Annual Meeting in Washington, DC. The paper will be published in the 2018 Transportation Research Record (TRR), Journal of the Transportation Research Board. The paper compared two methods of capacity estimation on US Data — HCM6 gap-acceptance and Kimber’s geometric model. Our statistical analysis showed that the geometric model was more accurate, and produced better predictions than HCM6 model. See the full paper here and watch the paper presentation below. Mark Johnson, PE will be giving three presentations at the 2018 TRB Annual Meeting in Washington, DC. 3) Mark will present his paper, “The Impact of Geometric Factors on the Capacity of Single-Lane Roundabouts,” which was accepted for publication. Co-authored with Ting-Li Lin, Ph.D., the paper compared two methods of capacity estimation – HCM gap acceptance and Kimber/Hollis’ geometric model. Our statistical analysis indicated that the geometric capacity model was more accurate. The uncalibrated geometric capacity model produced better predictions than the calibrated HCM6 model. This paper concluded that the accuracy of capacity prediction is improved by including geometric variation, and the geometric differences between roundabout sites were the primary cause of the differences in driver behavior at those sites. 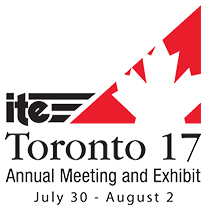 Mark T. Johnson will present during the ITE/CITE 2017 Annual Meeting and Exhibit on July 30 -Aug. 2 in Toronto, Ontario. The poster session on July 31, 3:30-4:30 in Exhibit Hall will include our poster “Solving Complex Issues with Innovative Roundabout Applications.” Several complex roundabout applications will be discussed including the closely spaced roundabouts at STH 83 / USH 18 and Blackwood Dr. / USH 18 in Wales, Waukesha County, WI. 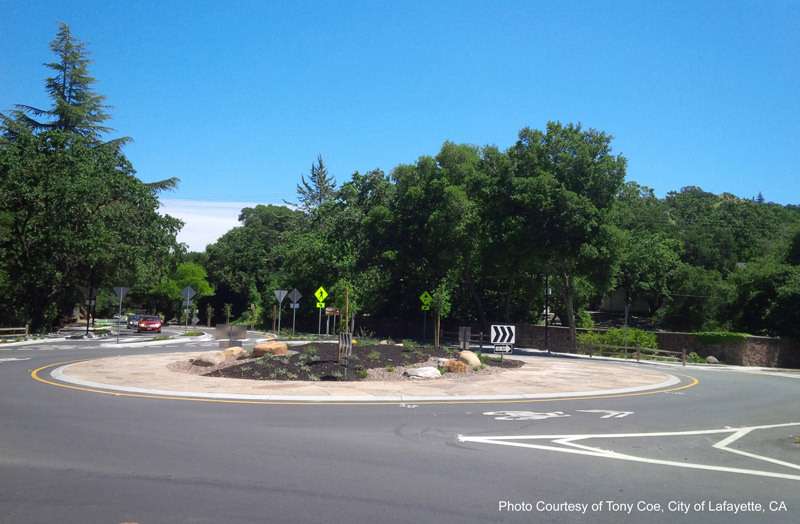 The first roundabout in Lafayette, CA is now open at Pleasant Hill and Olympic Blvd.! MTJ provided capacity analysis and final horizontal design, signing, marking, and ped/bike facilitation design for this roundabout. High levels of design alternatives and communication were involved with the City’s Ped/Bike Commission to address design questions and reach consensus on pedestrian and bicycle mobility and safety. Consensus was attained through design alternative development and thorough explanation and discussion about relative benefits of various design treatments. Project partner was Omni-Means. Mark Johnson, PE/P.Eng., will present a two-day training course for the Centre For Transportation Engineering & Planning (C-TEP) in Edmonton, Alberta, on Dec. 5-6. 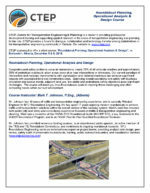 The course will focus on Roundabout Planning, Operational Analysis and Design. For more information, or to register, contact C-TEP at info@c-tep.com or 403-607-4482. Mark Johnson, P.E. will be presenting at the ITE Midwestern / Great Lakes District Joint Conference to be held June 26-28, 2016, in Chicago, IL. He will speak on “Design Principles for Optimal Safety and Operations of Multi-Lane Roundabouts,” Tuesday, June 28, 3:30-5 pm. He will present the poster “Public Outreach and Roundabout Implementation: Overcoming Challenges“ in the conference poster session on June 27, 1:30-5 pm. The location is the Holiday Inn Chicago-Mart Plaza River North, room number is TBD. Mark Johnson, P.E. will present his paper, “Access Management Case Studies with High Capacity Multi-Lane Roundabout Design and Implementation,” on Mon., Sept. 21, 2:45-5 pm at the AASHTO/TRB Access Management Conference in Seattle, WA. The presentation highlights case studies of properly designed roundabouts that enhance business access. Mark Johnson, P.E. will present his paper on “Roundabout Design Optimization for Safety and Operations” at the ITE Midwestern District Meeting. It will be held in Branson, MO on June 30.